Who is this entity, the Millenium Falcon? The history of the Millenium Falcon really begins with the history of Jabba the Hutt's "wanted society." Four Corillian jail in-mates, Han Solo, Lando Calrissian, Lone Starr, and Ardra. When Jabba the Hutt required a team to fetch a family heirloom from a museum on Aldalak, he summoned these four by way of bounty hunters. When they proved successful in this enterprise, Jabba rewarded them by making them his official smugglers. 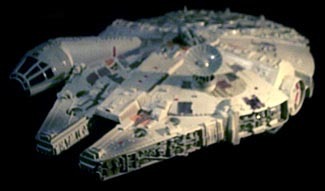 Lando Calrissian bought the Falcon from a local trader, but never found the time to fix it up to flying capability. He lost the ship in a card game to Han Solo and never thought twice about it. Solo fixed up the ship, adding in his own special gadgets, and created the fastest ship in the Jeda Quadrant, capable of completing the Kethel Run in less than 20 parsecs. Solo also installed false floor pannels to allow ideal hiding for whatever he happened to be smuggling. The Falcon is more than just a ship for the Falcon Crew, it's their home, a symbol of who they are. The ship has a large cockpit, complete with hyperspace projectors and tracking device. The engine room hosts hyperspace drive and twin impulse engines. The "special engineering" room contains warp drive technology and a three chamber transporter pad. The heart of the ship is the common room, fitted with a game table, a mini-bar, two dining tables, and several over-size chairs for comfort and leisure. There are nine rooms shooting off from the main common room. There are five bedrooms, one for each crew member, two guest rooms, and two rooms that serve as storage compartments. Also shooting off from the common room are the twin gunnery rooms, forward and aft, where crew members can manually control weapon fire in the event of an Imperial attack. The entire ship is crosswired for complete communication. There is a small machine shop for droid and weapon repair shooting off of the main engineering room. Doors are electronic and only open with manual switches, except for the gangplank which opens automatically when activated either by remote control or cockpit command.